Louise (Maria Rizzo), Momma Rose (Sherri L. Edelen), and Herbie (Mitchell Hébert). Photo by Teresa Wood. 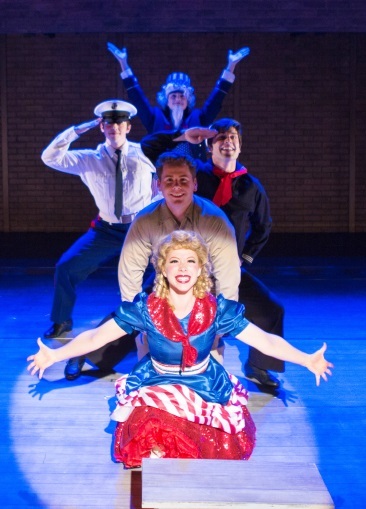 Shout hooray and hallelujah, the landmark musical Gypsy is now playing at Signature Theatre. Considered to be a perfect musical by many, including myself, this musical fable of an overbearing stage mother doing what she thinks is right for her kids, while boasting one the best scores and books ever written for a Broadway musical, is now back, so a whole new generation can see why it’s Rose’s turn to be noticed. 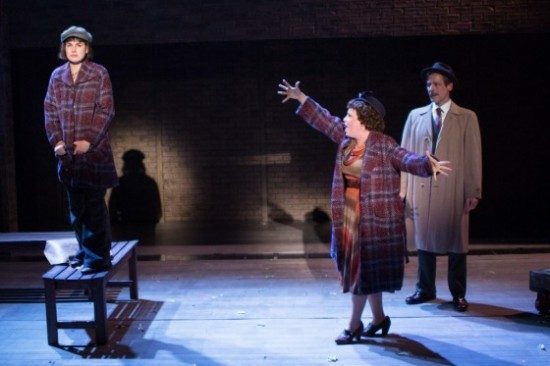 …a perfect musical…Rizzo gives a star quality performance. The quick version of Arthur Laurent’s book goes like this. We are in 1920’s Seattle at an audition for Uncle Jocko’s Kiddie Show. There we meet Baby June and Baby Louise (Erin Cearlock and Ellen Roberts). June has lots of stage presence, while Louise mumbles and keeps to the background. This is until we hear the booming sound of Rose (Sherri L. Edelen) from the back of the house saying “Sing out Louise.” From there this is a story of a mom who swears her kids will succeed in show business on the many vaudeville circuits of the time. 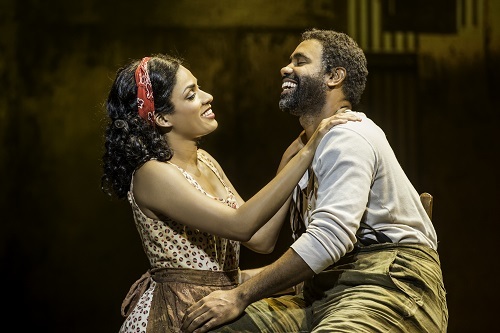 She creates an act with June as the feature called Baby June and her Newsboys. This works out for a while, but Rose keeps the act going and June becomes too old for the blonde Shirley Temple like act. Meanwhile we meet Herbie (Mitchell Hébert) a lovable schlub who goes from selling candy to being the kids’ agent. Even with a new act for the now older June (Nicole Mangi) (which bears a strange resemblance to the first act, except for the dancing cow), things don’t get better and June ultimately decides to go off on her own to pursue acting. Rose decides, however, to mold the now older Louise (Maria Rizzo) to be the next June and creates a Spanish version of June’s old act. Finally, when playing a burlesque house in Wichita, Kansas, June begins to shed her skin after meeting three strippers named Tessie Tura, Mazeppa, and Electra (Sandy Bainum, Donna Migliaccio and Tracy Lynn Olivera). When June is asked to go on for a missing dancer, things begin to change, as Louise becomes the famous classy stripper Gypsy Rose Lee. Rose is still seeing herself through her kids and….. go see it. Dainty June (Nicole Mangi, foreground), backed up by L.A. (Gannon O’Brien), Yonkers (Samuel Edgerly), Tulsa (Vincent Kempski), and Louise (Maria Rizzo). Photo by Teresa Wood. Performance-wise, let’s just get out of the way that Rose is a loud and brash character and the approach that Ethel Merman gave the role originally is always present no matter who plays this role. Sherri L. Edelen has all the brash and overbearingness for this role, but in act two there is a change to Rose that I did not get with her performance. At a certain point in the show, Rose realizes that she has to let go of Louise and you see Rose as human. While Edelen puts over Jule Styne (music) and Stephen Sondheim’s (lyrics) iconic songs like “Some People” and “Everything’s Coming up Roses” with all the power they require, I did find her “Rose’s Turn” at the same level, which is where the change usually happens. Edelen is absolutely right for this role, but I wanted that one missing component to make her performance complete. Other performance highlights include Mitchell Hébert’s Herbie. Here is a character that is sometimes a throw away but Hébert’s performance give him a backbone and yes Hébert can sing and does so quite well. As Louise, it did take me a little while to warm up to Maria Rizzo, but in the second half of the show when the character blossoms, the same thing happens with Rizzo’s performance. 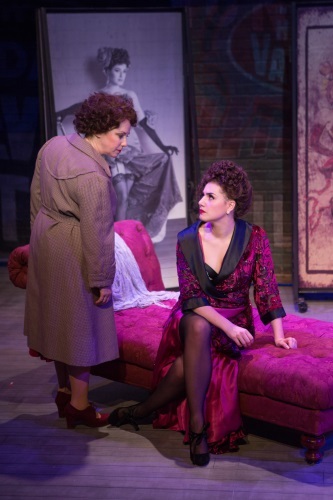 When we hit her “Let Me Entertain You” in act two, Rizzo gives a star quality performance. But by far the performances that steal the show are the trio of strippers played by Donna Migliaccio, Tracy Lynn Olivera, and Sandy Bainum. Their feature called “You Gotta Get a Gimmick” is a standout of the production and watching these three DC vets go at it during that song is musical theatre pleasure. While I did enjoy most of Joe Calarco’s staging, I do feel that one or two of the dramatic moments are blown though a little bit faster than they should be. Through all of the big splashy musical comedy numbers, Gypsy is a dramatic musical, so I wanted to see just a little more of that in spots. Regardless of that quibble and with the help of James Kronzer’s great backstage settings, Calarco’s flow of the production and scene transitions are seamless. Momma Rose (Sherri L. Edelen) and Gypsy Rose Lee, aka her daughter Louise (Maria Rizzo). Photo by Teresa Wood. Karma Camp creates her usual brilliance with the choreography and Jon Kalbfleish conducts a swinging and great sounding eleven piece orchestra. Yes, I did miss the live strings on ballads like “Small World” but for what the reduction is, it sounds full and captures all of the voicings from Sid Ramin and Robert Ginzler’s legendary originals. At a time when most shows cut the overture this production wisely does not and I applaud all involved in that decision. For those of us who have seen the show over the years, the Signature Theatre’s production showcases how perfect the material is in construction. There is a reason why after 54 years this show is still being performed. As we approach the New Year and what DC area theatre has to offer us in the way of new works, it’s good every once in a while to revisit a classic. I can think of no better classic than Gypsy to do this with and no better place to do it at than our premiere area home for musicals. Running Time: Two Hours and 50 minutes with one intermission. Gypsy plays through January 26, 2014 at Signature Theatre — 4200 Campbell Avenue in Arlington, Virginia. For tickets, call the box office at (703) 820-9771, or purchase them online.